"Luxury country retreat on the edge of Belfast"
Should you wish not to venture into the City, listed below are some of the local attractions, activities, pubs and restaurants that are within a 4 mile radius of the property. Castle Espie Wetland Centre, Comber – contains Ireland’s largest selection of ducks, geese and swans. Great walks, feed the ducks and view wildlife over the lough shore from the hides. Belfast Zoo – home to over 140 types of animals, most of which are under threat in their own habitat. Experience great views over Belfast and Belfast Lough. Exploris, the Northern Ireland Aquarium Portaferry - explore and experience marine life that exists around our shores. A new purpose built seal sanctuary is among one of the latest exhibits to be opened. Streamvale Open Farm, Dundonald – a working farm producing 1 million litres of milk every year. Nature trails, animals to feed and cuddle,Trailblazer adventure playpark and enjoy homemade icecream at the Creamery. The Ark Farm, Conlig – pets corner, pony rides, large variety of rare breed cattle, sheep, pigs and poultry, waterfowl, alpacas & deer tame enough to feed. Cottage tearoom provides lovely homemade scones and fresh jam. The IceBowl, Dundonald – ice skate at Northern Ireland’s only public Olympic size ice rink, become the king of the lanes in the Xtreme Tenpin Bowling Centre or go wild for the adventure and excitement of the Indiana Land Soft Play Kingdom. Drop in for some chocolate coated fun at the Choc-o-bloc, the recently opened novelty chocolate making centre. The Odyssey, Belfast – where entertainment comes alive. Experience a Belfast Giants Ice Hockey game in the 10,000 seat Arena, visit the W5 Interactive Science Centre or simply have a bite to eat in the many bars and restaurants available in the Pavilion. David Lloyd Club, Dundonald – offers top quality tennis, fitness and gym facilities. Indoor and outdoor swimming pools available. Omniplex, Dundonald - 6-screen Multiplex Cinema offering all the latest films and movies in 2D and 3D. The Somme Heritage Centre, Conlig – Step back in time and experience life as it was in the time of the Trenches of World War One. Guided tours on the hour every hour. Children can dress up in trenchcoats and tin hats. Cafe open daily. Mount Stewart House and Gardens, Newtownards – a National Trust property ... –explore one of the finest gardens in Europe, enjoy spectacular views over Strangford Lough and discover the fascinating history belonging to the seat of the Londonderry family. Castle Ward, Strangford – a National Trust property – an 18th Century mansion built in both the Classical & Gothic styles. Set in 820 acres, there are natural trails, exotic gardens, stunning vistas, house tours, restored stableyard containing exhibitions & a tea room & more. Rowallane Gardens, Saintfield – a National Trust property – set in beautiful surroundings these restored gardens provide the visitor with enchanting displays of rare and exotic species brought back from around the world. The Rock Garden Wood is well worth a visit, as are the various tranquil walks through the variety of rare and exotic Rhododendron bushes. St Patrick’s Centre, Downpatrick – step back in time to the medieval town of Downpatrick and learn the history of the patron saint of Ireland. Provides a great family day out and is an important destination for visitors interested in Saints and Scholars and the Early Christian Church. Scrabo Country Park between Newtownards & Comber – situated on the shores of Strangford Lough are the North & South disused stone Quarries where the local scrabo stone was once quarried for many years. Visit Scrabo Tower and learn through the interactive displays of how the stone was quarried and where it was shipped to. Enjoy the extensive views of North County Down and beyond to the Mourne Mountains from the top of the tower (after climbing all 300 steps!). Enjoy the many trails through Killynether Woods. Crawfordsburn Country Park, Crawfordsburn – located on the southern shores of Belfast Lough. 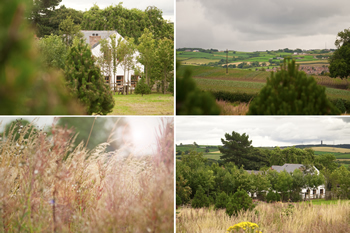 With two spectacular beaches, stunning scenery & tranquil walks through wooded glens with a stunning waterfall, this place provides a natural relaxing retreat. Islandhill, Comber – accessible at low tide this walk around Rough Island provides magnificient views of Strangford Lough and is an excellent view point for bird watching. Wolfes Restaurant, Omniplex Retail Park Dundonald – gourmet burgers made inhouse and on the spot. Perfect for before or after a cinema visit. All ages catered for. Blue Chicago, Omniplex Retail Park, Dundonald – run by the same family as Wolfes this provides you with an extensive all day menu of simple traditional food with an American influence whilst boasting a unique Blues Cafe Environment. Gaze, Asian food for everyone, Omniplex Retail Park, Dundonald – quality Asian Cuisine served in house and as a take away. Cinnamon, Dundonald – award winning Indian restaurant and take away. The Willow, Dundonald – Chinese restaurant where you can sit in or take away. Fully Licensed. Tropical, Comber – Chinese & Thai Cuisine at its best. Take away only. Balloo House - freshly cooked, local and seasonal produce served to you in the surroundings of what was an old coaching house dating back to the 1600's. The Bistro caters for all ages whilst a more formal restaurant upstairs, provides a little bit of luxury for that special occasion. Daft Eddies - this restaurant/bar nestles into Sketrick Island on Strangford Lough just 10 minutes from Comber. It is renowned for its local produce and fresh quality sea food, in particular it's oysters and lobster. All ages catered for. The White Horse, Saintfield - dating back over 200 years this busy bar & bistro offers traditional and modern cuisine and a wide variety of beers & ales. As the Bar is part of the largest working micro-brewery in Northern Ireland, the beers and ales are changed on a weekly basis, thereby offering a wider selection, than most other local bars/pubs. Dundonald & Comber have easy access to both Asda & Tesco supermarket chains. Open 7 days a week. Both villages have good post offices open 6 days a week. Guests are invited to browse the leaflets and brochures inside the property for further information on where to go to eat and drink.